Some players will never be convinced of the merits of digital modelling amps, but here's one that may well persuade you. Great tones. Authentic feel. Light weight. Well priced. Having to buy an external footswitch to maximise potential. As Line 6's Spider amp range is among the bestselling all around the whole world, the launch of the fourth series is big news. The range comprises smaller 15- and 30-watt combos, as well as larger, more advanced items, such as a 150-watt head and the 75-watter we have here. So what's the deal? "We set out to try to improve on what is already an extremely successful product, without accidentally fixing what wasn't broken," says Spider IV's product manager Scott Waara. "We wanted to see if we could improve on what we and some of our customers perceived as not being our strongest points without altering the things that already work well. We carried out surveys and then just came back to the amp and tried to satisfy our ears and instincts. "One priority was improving the mid-gain, edge-of-break-up tones. We did this by both adding some new models and by making all of our models more responsive to the player's touch. We had some ideas on how to do this in our approach to the software code, and it seems to have worked very well. Another major priority was getting all the amp models to feel better, achieved by working on both the software code and the cabinet." In fact the number of amp models has increased from the 12 on Spider III to 16, with the addition of Class A and Hi-Gain options, which are selected via the customary eight-way rotary control that also provides two differently voiced settings for each one. Included on the palette now are tones based on classic amps from Divided By 13, Marshall's JCM900 series, Hiwatt and Diezel. "Kudos goes to Line 6 for the sound and feel of the light break-up to medium-gain tones." Effects have also benefited from the rethink and their number has increased to a total of 20 with the facility to use four simultaneously. They're controlled via Smart Control FX pots on the front panel alongside the small yet perfectly legible LCD display. "We can now 'deep dive' into up to seven effects parameters," continues Waara, "including the ability for all effects to be routed before or after the amp model. "This level of customisation is made manageable by the larger LCD, which aids navigation. We wanted to come up with a way of keeping it simple for the guys who just want to plug in and get a great sound, while offering gigging players a way of dialing in exactly what they want." Alongside the familiar wealth of modulations, reverbs and delays are new options such as Pitch Glide, a whammy-style effect and Smart Harmony - Line 6's first foray into the murky world of real time guitar harmony. There's a Looper too, mooted as the most guitarist-friendly yet, and we've checked that out in the video demo. 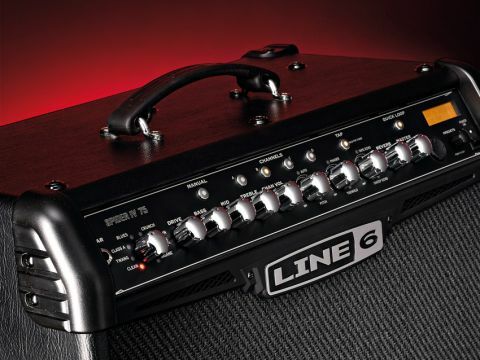 We've always admired the concept of including artist-specific presets designed by the players themselves and it seems that, even here, Line 6 has upped the ante. One of the most surprising inclusions for us was that of Johnny Marr, a dyed-in-the-wool old-school gear head. "Johnny has used a lot of our stuff including PODs and, most recently, Spider Valves," Waara says proudly. "He was making an album in LA this spring, and we ended up going over to the studio several times." There are now over 300 presets provided by 50 or so artists - 25 of which are newcomers to Spider IV. "For the artist preset process," continues Waara, "we take amps to folks, send them out on the road with them, and try to grab them when they're playing locally. We ask them to make presets that make them happy, and ones they think their fans will enjoy and expect." That's most of the theory and science dealt with. But can it live up to the hype? The final frontier of a digital amp is indeed how it feels when compared to the amps being modelled. A 'real' valve amp's tonal idiosyncrasies are one thing, but the feel is quite another, and extremely difficult to recreate digitally. It's here where amps such as this new Spider IV will stand or fall. Ultra cleans and mega filth sounds are usually up to snuff, but kudos goes to Line 6 for the sound and feel of the light break-up to medium-gain tones in the Spider IV. For example, the red option of the Blues model - based on a 1953 wide-panel Deluxe - both sings and blooms like Katherine Jenkins in a field full of daffodils. Likewise the Class A and Twang modes offer more usable and satisfying tones for sensible home use than all manner of small-wattage, all-valve beasties. Editing is a doddle once you're up to speed with the processes (as ever, don't forget to save), and even the 14-second looper function is intuitive, engaging and, most importantly, very simple to use. Perhaps basing the Red Clean model on the Marshall JCM900 - an amp hardly lauded for its sparkling cleans - might prove to be something of a miscalculation, but the truth is that it sounds good nonetheless. It highlights the fact that preconceptions aren't a great deal of use when it comes to getting sounds - just use your ears and don't worry too much about the names! Getting the most from the myriad artist tones can depend on your familiarity with the name in question, but it's a sour player indeed who doesn't sport a huge grin when, for example, knocking out the riff to Brown Sugar using that specific preset. While we're on the subject, Johnny Marr's quartet of presets are great too. There's no discernible delay between switching tonally contrary sounds, even though you'll need to shell out for either of the footswitches to do this onstage. From warm cleans and fruity crunches all the way to skull-crushing metal explosions, the Spider IV is the best sounding of the series so far. To conclude our chat, we ask Scott about the possibility of Spider V? "Who knows? Maybe Spider IV is the last amp you'll ever need," he tells us with a smile. It's clearly the latest in a long line of learning for Line 6 - if you haven't played a digital amp in a while (or indeed never) make sure you try this. It's the most advanced and authentic sounding Spider yet. Line 6 doesn't pretend that dialing in, for example, the Twang setting is absolutely the equal of a '65 Fender Twin - of course it's not - but it is certainly close enough for players who don't live or die by that sound, whether at home, in the studio or for rehearsing. Users of big, quality valve amps won't be convinced for live use, but if you want to continue to drag numerous amps around with you, you go ahead!